LCF will be able to offer conversion variants on both the Airbus A320 variants together with the Boeing and Airbus widebody fleets. On the A320 fleets our plans are to offer main deck conversions on all three A320 variants (A319, A320 and A321). See the LCF A320 NGF web page for more details. On the Airbus widebody fleets LCF will offer conversion options on the A330 and A340 variants. See the A330 LCF and A340 LCF web pages and the News web page for more details. 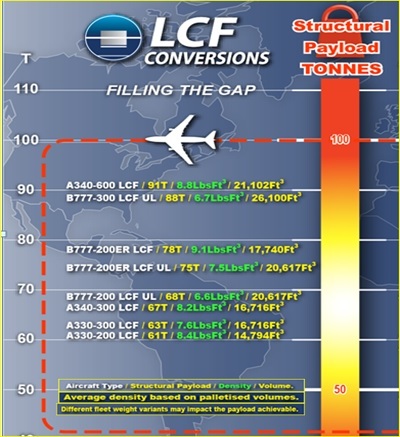 The table below illustrates the potential LCF widebody freighter conversion capabilities, specifically their respective gross payload and average density with a full payload. The LCF conversion retains the full range capability of the donor passenger variant and if required, the airframe can be converted to a combi or back to all-passenger configuration.